January 31, 2019 January 31, 2019 ~ Mike K.
Play if… you ever wanted to work in a high-tech lab. Avoid if… being in a white room for an extended period of time may remind you of your stint in a mental institution. Description (from the company website): Dr. Prescott Joule, Physicist, has hired your team to look after his lab while he is away on a scientific mission! The moment you enter the lab you’re confident that something strange is going on. You may be in for more than you bargained for! Can you figure out what he is up to? Staging Area: a very large lobby with a reception desk, small fridge with bottled water (free to players) and some seating along the walls. Metro Access/Parking: in Lynchburg, so you’ll have to drive or figure out the public transit system. Description of the room: You are in a high-tech lab with lots of scientific gizmos and doodads. Understanding of the Mission: You and your team are hired to look after a lab for a wacky scientist. Little did you know that YOU have become part of his scientific research. Can you figure out what the experiment is and escape within 60 minutes? Our Suggested Party Size: We had 3, which seemed to fit our group (but we’re good friends and work together pretty well). We’d likely recommend 4-5. A professor thought he’d experiment on The Escape Room Guys. The Guys messed with his results. We hadn’t seen our buddy Rohan in quite a while, since he moved to Lynchburg, so it was about time we took the drive to see what all the fuss was about. And you know the drill, new place == do an escape room. So we booked a few and offered to bring Rohan with us. Ironically, he’d been to this place with some friends before and had done one of their rooms but not escaped, so he ended up doing that one with us (and got out, naturally). That room was pretty cool so I was excited to see one that was a little more on the high-tech side. Read on. 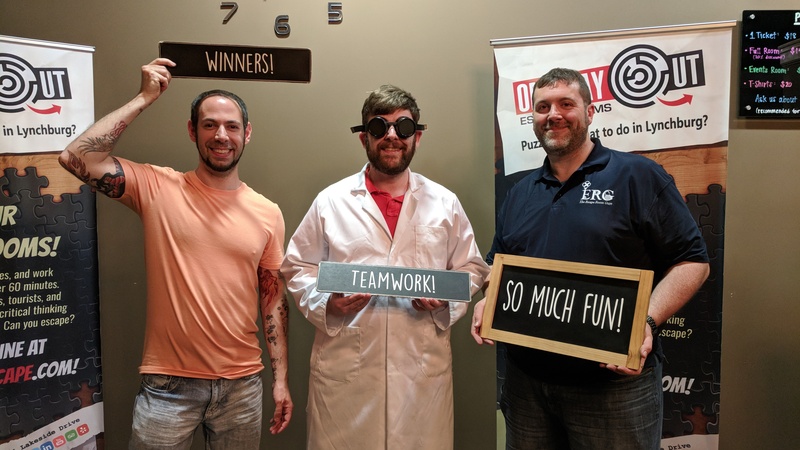 While visiting our friend, Rohan, in Lynchburg, VA, we checked out all the local escape rooms and booked a few to complete while we were there. This was actually the second room that we did at One Way Out Escape Rooms (first one was The Lost Professor), and we ended up being invited back to do the room that was closing (The Shuttered Room). We had a great experience in The Lost Professor, so we were pretty psyched to do another of their rooms… one that had the promise of a lot of hi-tech puzzles and locks. You’ve been hired to look after Dr Joule’s lab while he is away but you entering the lab you quickly realize something is fishy in the lab. Can you figure out what he was up to? Which of those sounds better? One is the website, one is what we we’re told before entering. We’ve talked about what it is to be immersed in a story and having two distinct stories given really chafes my willy. Rating: 5/10 A well-renowned professor has hired you and your team to look after his lab while he is away. Little did you know that YOU are the experiment and had better figure out how to escape his lab experiment. We’ve done a number of laboratory rooms, and this is quite a common theme with escape rooms. However, there is a nice spin on the standard “you’re locked in a lab and something happens and you have to find your way out.” The premise of being hired by the professor to look after the lab as the lure to get you in there was a nice twist. You get a good level of detail before going into the room, and while the theme isn’t fully original, it has a fun story line that really puts you into the experience as soon as you enter this room that has tons of gadgets, gizmos and whoozy-whats-its. The only thing we were actually told to do was to “follow his directions carefully as he’s very precise.” I assumed, based on the looks of what’s in the actual room, that we needed to get out (I mean, it’s an escape room after all). No specific task needed to be performed (unless you count what you had to do to open the door), other than the side task of feeding the dog. There was so much that could have been done to spice this up (or spice up the story for that matter) but it seems like that was just happenstance and played second fiddle to just getting out. Don’t get me wrong, there was plenty to do for 3 people, but not sure what was actually necessary, nah mean? Rating: 2.5/10 Now that you’ve found out that YOU are the experiment and are being monitored, you have to solve the puzzles in the room and escape. Again, it’s pretty clear as to what you have to do, and how to get there poses a bit of a challenge (and we only had 3 people to do the room), so this worked in our favor in getting pretty into the puzzles and locks as to how to figure out how to get out. The spin gave this theme partial credit on the originality factor. However, there is a mini-mission to feed the professor’s dog which was a fun little addition. The puzzles in this room weren’t particularly difficult but there were a few that needed some clarification. While there weren’t any red herrings, there were plenty of puzzles that couldn’t be solved right away, though you knew exactly what you needed to do for them. I know that sounds backwards, but it’s true and you’ll understand when you’re in there. Everything is in plain sight (not even hidden) but the actual data inputs are what’s missing and needing to be found. Plenty of work for 3 people, however, including branching paths, so each of us kind of worked on one path at a time. Rating: 7/10 With a laboratory setting, you’d expect to find a lot of tech in the room, and this one didn’t disappoint. We did have some of the standard locks that you’d find in most escape rooms (combo locks primarily) but they did fit what you’d also see in a lab (such as locked drawers or locked cabinets for pieces of equipment). Lots of observational puzzles in this room, which is where one of our clues had to come in because the three of us kept missing it. This may be overall the part of the design of the room because YOU are also being observed. However, some of them were takes on what we’d seen used elsewhere, so we at least had an idea as to HOW to attempt to solve it. I really did love the big tech machine in the middle of the room (not a spoiler because they have photos of this on the booking site), and you really have to explore every panel and flashing light to figure out where you are in the room and what can be triggered by something else you’ve done. As I said above, nothing particularly difficult, just a couple things that needed clarification. There were one or two frustrating puzzles (one was referenced above) but I don’t want to prime you with anger or skepticism beforehand, so I will not talk more about it. There wasn’t much difference in difficulty, in my opinion. We were all go all the time in this room with only minor stutters. One thing of note: You will need at least 4 hands to do this escape, so bring a friend. Rating: 5.5/10 There were some puzzles in this room that you had to really think about and see what happened when you tried different components of the tech, or how the things you found related to a puzzle somewhere else in the room. The room had a good flow of easy (quick wins) and some others that required some team ability (there was at least one puzzle that required two people). Some of the puzzles also test your ability to work together as a team… one person could certainly do it, but if you’re able to communicate well and take different parts of the puzzle, you’ll solve it much faster. There were points where two of the three of us were working on one puzzle, and the other was taking notes on the whiteboard, or exploring other parts of the room. I will give this room some props for looking like a lab (with a nuclear reactor core protruding through the middle of the room). There was much back and forth across the room, which is good, and there was much shouting. The whiteboard was also well used (and I mean that in the sense that we used it a lot). Everything worked for being in a lab, but I still feel like the lack of actual story line lowered the overall quality of this room and what it could have been. I didn’t feel like I was doing anything particularly useful or life-saving; I was just solving puzzles to open a door. And I’m not quite sure everything was as high-tech as Mike is making it out to be. The only real tech was that center console and only parts of it. Rating: 8/10 The room was well designed. The decorations and formulas and signs on the walls were all consistent with what you’d find in a lab. The tech with the flashing lights and gizmos really helped with the immersive experience and lent credence to the fact that you WERE in a lab. I did like how the room flowed… it was not linear until about half-way through the room (all rooms have to become linear at some point), which allowed us to work independently and in small teams. At some point, even all three of us were working on puzzles, which helped keep us together as a team. The tech was unique to the point where we hadn’t seen those exact puzzles before, and that was a pretty cool use of their design expertise to make the room more of a science experiment vs. a medical one. And, everything in the room did fit in with the story or mission… I can’t recall one item that I thought was out of place. There were some aspects of this room that I enjoyed, but also those that frustrated. Overall it was ok IMO. I definitely had a good time in the room. Some parts were slightly frustrating until we found our way, but the room was well designed and we were pretty much immersed in the experience from the time we entered the room until the time we left. Having helped us through the first room, she knew enough now to leave us be unless beckoned. Our GM was great. Knowing from our experience of doing the first room at this location, she knew not to chime in unless we fully asked for a clue, or a clarification that something operated in a way we believed (this is more common with tech rooms… not that it was a recurring issue in this room). One clue made me feel more annoyed than stupid. But not because it was a giveaway, just because, IMO, the puzzle was poorly executed. We only asked for one, which is something we all overlooked while observing the room. Rating: ?? I’m going to give this a 3 because that one puzzle we overlooked was fully obvious once we got the clue.